While we in North America were sleeping, a serious lift incident unfolded in the Caucasus Mountains, where Europe and Asia meet. Videos posted to YouTube and Facebook show a Doppelmayr fixed-grip quad picking up speed in reverse and chaos ensuing on an already crowded powder day. Any riders who didn’t jump were thrown from the lift at the drive bullwheel or pinned between mangled chairs. Georgia’s Ministry of Economy says eight people sustained non life-threatening injuries. Another picture shows chairs piled up after the lift came to a stop on what would normally be the arrival side of the drive station. Some grips held on while others were ripped from the haul rope after going around the bullwheel. From looking through Doppelmayr Worldbooks, I believe the lift in question is called Sadzele, built in 2007 as one of six lifts at the Gudauri ski resort. Note that fixed-grip lift models Doppelmayr sells in the U.S. and Canada differ significantly from those found in Europe and elsewhere. – The cover for the motor enclosure appears to be open from the beginning of the videos. – Snow indicates it happened in the morning soon after opening. – The people who waited to jump until just before tower 1 were smart. – Many people took out their phones to film it rather than getting out of the way or trying to help others. Michael- Thank you for this local information. Please continue to post as you obtain more information. Some of that assumes the stop buttons/systems were functioning correctly. What type of braking system does a modern day high speed lift have on it? Was it simply a matter of hitting the big red emergency stop knob, or would they have needed to do something else as well with a rollback like this? I know there are roll back devices on lifts such as tags that drop into the bull wheel to help stop it, but I know that each lift manufacturer does their roll back prevention differently, so curious to know what you mechs and lifties know and are taught to do in a situation like this. Grant it, we won’t know the full story of what happened here until the investigation so everything is just speculation at this point. Modern lifts have redundant systems that are generally designed take the attendant(s) out of the equation in the event of something like this. In other words, lift should have stopped itself before it got going as it did, whether or not anyone pushed any stop buttons. I suspect we will learn multiple things went wrong as is usually the case with plane crashes, bridge collapses, etc. these days. Note the lady whose ski ended up in the bullwheel guideage. Very lucky she went the other way and wasn’t killed. Same story with the poor guy in red who ended up under all those chairs. Didn’t they have to hand pump a brake at Sugarloaf? Very lucky they had somebody that could keep their wits about them during a rollback. on a modern lift like this, there should be no manual pumping required. I used to work on 2005-2006 Doppelmayr fixed grip triples & detachable quads, so with this being an ’08, I would assume it is pretty similar. This is now the number two story on CNN.com. When I watched the video for the first time, I would have jumped from higher. Now I realize it makes more sense to jump from 1 meter. Some people on youtube say that the people who did not jump should have been injured. I think they are wrong because it takes a lot of courage to jump off a fast moving, out of control lift. 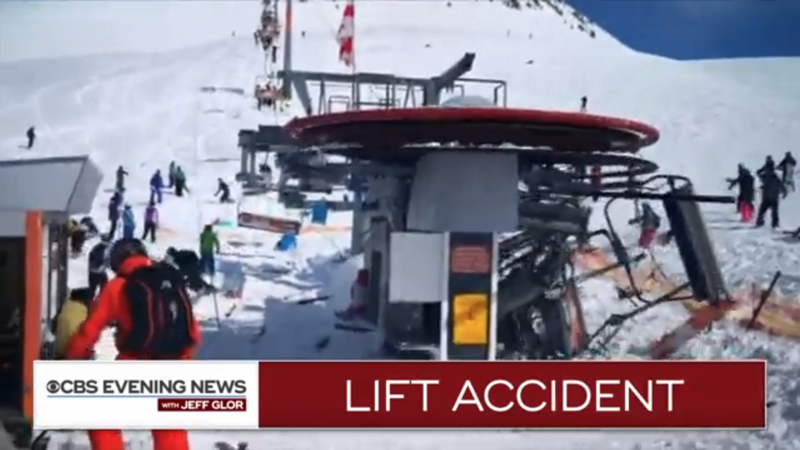 My problem with today’s lifts is that there are lots of accidents on newer lifts (like this one) and there is no backup if the controls go down. The lift operator can manually stop the lift, but if your a lift operator and you are in front of a lift that goes out of control, then you would most likely not go in front of a lift that will knock you out, and maybe hurt more people. Every lift I have ever worked on a loss of the controls closes all of the brakes. The weight of the passengers is what was driving the lift down the hill, removing the power would not help. It was not a ‘high speed’ lift. It was a fixed-grip Quad. There are usually no drive train backstops in Europe, but that might not have helped on this lift, if there was a broken shaft or coupling anyway. There should have been a working bullwheel brake or the equivalent, as a last resort. But if that happened to be blocked with ice in the hydraulic system, there might not have been any way to prevent this type of problem. Drop dogs might have helped if the main shaft had broken. -The government has launched an investigation. -Two people with serious injuries were taken to Tbilisi for treatment. -Some sort of inspection occurred on December 22, 2017. Don’t think there typically using an independent bullwheel rollback brake in the EU. as is required in ANSI. But it doesn’t look like 12 brakes would of helped if non were operational. Even if the lift had a reverse for some reason the over-speeds should have set a bullwheel brake. Question- in reading your post, you mention that the Doppelmayr of Eu differ greatly. I’m not well versed in lift design, but why do they differentiate? Seems like they would want to use the same technology and safety systems worldwide, but perhaps it’s a cost issue or? From what I can tell Doppelmayr detachable lifts are more standardized globally than their fixed-grip lifts. I don’t think the compact drive terminal model on the accident lift was ever sold in North America. Current fixed-grip Doppelmayr USA lifts have different towers, different terminals, different controls, different bullwheels, etc. from ones built in Europe as the designs are market specific. I am not sure why. Doppelmayr USA uses fixed grip designs that are based on Garaventa CTEC fixed lifts that is why they don’t look anything like the Austria products. The model in the vid has been called the mushroom drive terminal and is fairly standard overseas. Lift design is governed by the codes of the jurisdiction that a lift is used in. US code is ANSI B77, Canada and any commonwealth nations use the Z98 code. Europe uses CEN as a baseline and then some nations add to it. Eastern Europe and Russia I have no Idea about. A chair lift is like a passenger train going up a very steep hill, what keeps it from rolling back down is first the motor and then the braking systems. If something breaks between the motor and the drive bullwheel, then a bullwheel brake or a “drop dog” has to immediately catch the train. Any delay and the train accumulates so much force that it destroys whatever is in its way. Doppelmayr makes the best lifts in the world and has the best automatic braking systems I have seen. This proves my point exactly that older lifts are much better. Old lifts had physical rollback devices, like on CTECs and Muellers, nut they don’t have them anymore so the lift can RUN BACKWARDS, and other stupid reasons. Whoa, I’m hearing that Doppelmayr, world famous lift manufacturer engineered and built this lift with no low speed brakes at all! What did they think would happen? 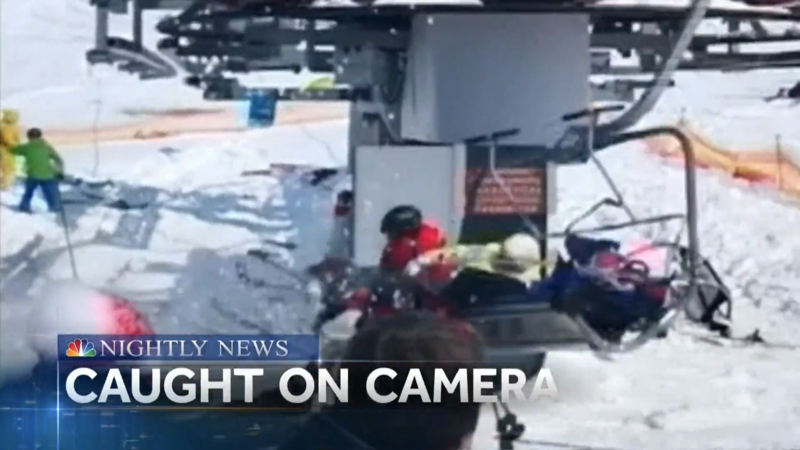 We don’t know what the cause was, but I was surprised to hear this was a Doppelmayr lift. Seemed like more of a Yan/Borvig thing. LE Yan had a mouse trap activated drop dog design that from what I remember worked 100% of the time, now the bull wheel or chairs staying on the lift thats a different issue. This longer video shows the lift was stopped before the rollback begins. You can also see the actions of at least three lift staff. One person runs into the operator house and another presses buttons on the outside controls with no apparent effect on the lift’s movement. 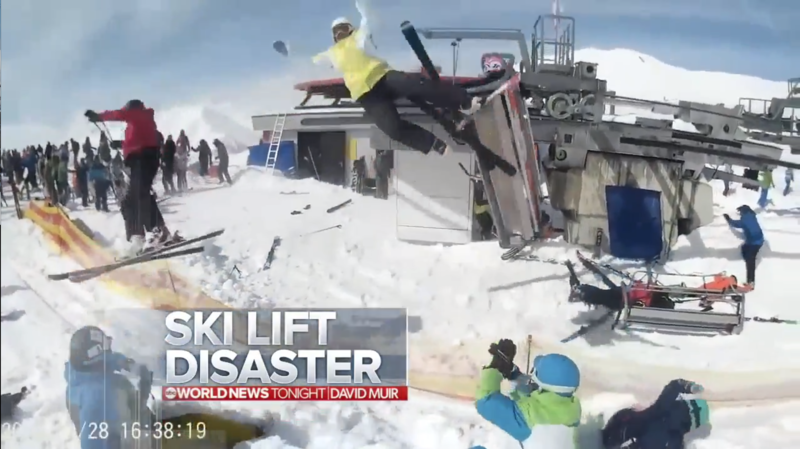 I’m beginning to think that this is just like the Winter Park Eskimo lift destruction testing when it rolled back, the only reason it stopped was because things got jammed which applied enough friction against the rope to slow and stop it. The manual brake pump scenario is being discussed on the German language lift forum. Pictures of a brake unit supposedly from a similar lift are included. The Georgian government has selected the French company Bureau Veritas to lead the investigation. Five of the now eleven people confirmed injured remain hospitalized. If all the pictures in the link are the same lift then its a Leitner detachable, not a Doppelmayr fixed grip. Don’t go posting stuff to discredit one lift manufacturer over another lift manufacturer. It is a Fixed grip. Detachable terminals do not look like the one in the video. Andy- He’s referring to picture # 2 on the link to alpinforum.com discussion posted above. It clearly shows a pump with a Leitner label on it in a detachable terminal. It is that photo that is incorrectly linked to the obvious Doppelmayr fixed grip lift in the country of Georgia. Could it be that the operators were trying to evacuate the lift because of a power outage? I tried to see in the long video whether the other chairlift was moving. Very tough to tell though. An Austrian photographer filmed well over a minute of flying backwards. It looks very fast but also smooth and quiet like riding on a detachable lift. He says the lift was stopped for about two minutes before it started rolling back and it took two and a half hours to be rope evacuated afterwards. I am surprised by the amount of media coverage this event has received. One thing is for sure, having read the numerous comments on social media, is that almost everyone is an authority at chairlift designs and their operation! People watch a minute long shaky video and suddenly become experts. I am amazed by the general lack of understanding by the average person of how ski lifts work and even by those who work in the industry. With so many different designs over the years, code requirement variations, and a complete lack of knowledge of this particular lifts maintenance and operational history, it is impossible to speculate what was the cause. Thankfully no one was killed. I look forward to reading the results of the investigation. Don’t be surprised and amazed by all the media coverage. There’s a new sheriff in town. No more covering up poor maintenance and faulty design. Half the people on the hill have cameras on their heads. No, not a minute of shaky video. More like a half hour, not shaky, and from every angle. The phenomenon of rollback on wire ropeways is nothing new; it’s been around long before chairlifts were devised. No excuses; somebody really screwed. And the video? Get used to it, the cameras are everywhere. “The lift is a 4-seater fixed grip chairlift and was built by Doppelmayr in 2007. Doppelmayr specialists arrived in Gudauri on Saturday morning (17th March 2018). The last couple of days the accident and possible causes where examined by authorities and an independent test institute (Veritas France). Doppelmayr specialists were allowed to monitor the investigations. We support authorities and our customer extensively. At the moment, authorities are working on the investigation report. I find it curious that apparently no attempt has been made to clean up the mess following this incident.